MicroSummary: Peter Thiel founded PayPal and was one of the first to invest in Facebook, making him one of the most influential billionaires in Silicon Valley. His unique reasoning for evaluating new business will show you a new perspective on how to set up a startup and be successful. This summary will enable you to know the philosophy and advice of Peter Thiel, which was documented by one of his students (Blake Masters) in a chair at Stanford college. 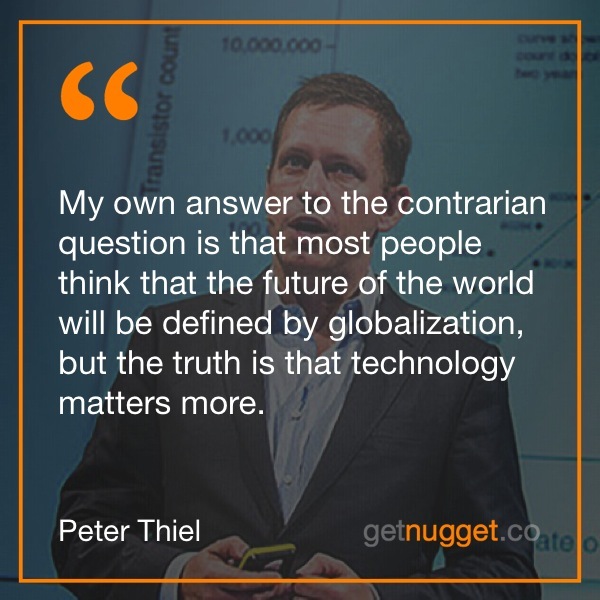 Thiel is today one of the most important investors in the world. This summary will show you that in a startup, going from “0 to 1” is more important than going “from 1 to n”. This is the question that PayPal co-founder, Peter Thiel asks his interviewees. From the beginning of the book, this brings us a peek into the billionaire investor’s way of thinking. Peter Thiel’s contrarian way of thinking helped him invest in some of today’s largest internet companies like Facebook, Airbnb or Spotify. In his book, Zero to One, Thiel shows what it takes to go from Zero to One. To make Vertical Progress. 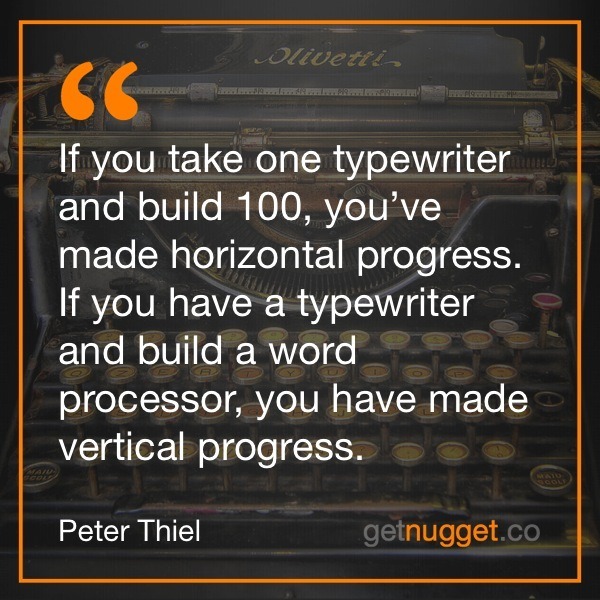 If you take one typewriter and build 100, you’ve made horizontal progress. If you have a typewriter and build a word processor, you have made vertical progress. For many people, the progress that we will have in the future is an interesting subject to think about. And for Thiel, progress can be divided between horizontal progress and vertical progress. Horizontal progress comes from expanding existing ideas and innovations and gradually improving these concepts. Globalization is an example of horizontal progress, as it helps to distribute existing technologies to more and more people around the world. But vertical progress, however, comes from creating something that did not exist before, as a new technology or an extremely efficient method to do something. Horizontal progress is “going from 1 to n” while vertical progress is “going from 0 to 1”. An example of horizontal progress would be the mass production of Tablets and their distribution to developing countries; An example of vertical progress would be the launch of the first iPhone, which brought about the smartphone revolution. As you can imagine, vertical progress is difficult to predict because you have to imagine something that does not yet exist. If you long to imagine what the future holds, you should be able to see the present critically. Thiel values the “contrary” and different visions of the mainstream. An interesting example is one of the questions he asks when recruiting candidates for his companies. He asks, “From what popular belief do you disagree? Why?” According to Thiel, only people who flee established conventions will be able to affect the future and go from zero to one. There are many options and variables and, in a way, it is useless to try to prepare for the future. The important thing is to focus on creating the future that suits you best. You need to be an active person in building your future so that you can indeed be master of your destiny. Focus is crucial. In his Stanford course, Thiel emphasizes that students often enroll in a multitude of diversified extracurricular activities to graduate with a broad curriculum, but he argues that is not the best approach. For Thiel, the right path is to focus all of one’s energy on mastering just one subject so that the student can be the best at least on one thing. The focused effort is necessary for success. What has led masters like Steve Jobs and Thiel himself to found several successful companies was actually the power of this focus on being really good at a limited set of things. People tend to associate monopolies with a terrifying business environment, with companies working to destroy each other, an erroneous view, according to Thiel. Competition seems to be a necessary economic stimulus as businesses try to constantly improve their products relative to others. However, monopolies are the actual creators of innovation. In a monopoly, it does not necessarily mean that you are being unfair to the competition but only doing something much better than others which in turn cannot survive. Creating something new that no other company can copy is essential to building a monopoly. Google is nothing more than a monopoly in the Internet search industry, having faced virtually no competition. That may seem unfair to other companies that would like to compete in the search business, but it is definitely good for users of Google’s search engine. It is simply years ahead of all his competitors. Moreover, monopolies are good for society as they drive progress: they encourage other companies to create better solutions to expel the current dominant company. For example, if a company wants to compete in the search market today, it needs to invent a much better search engine than Google. And, if that happens, the beneficiaries will be the internet users. 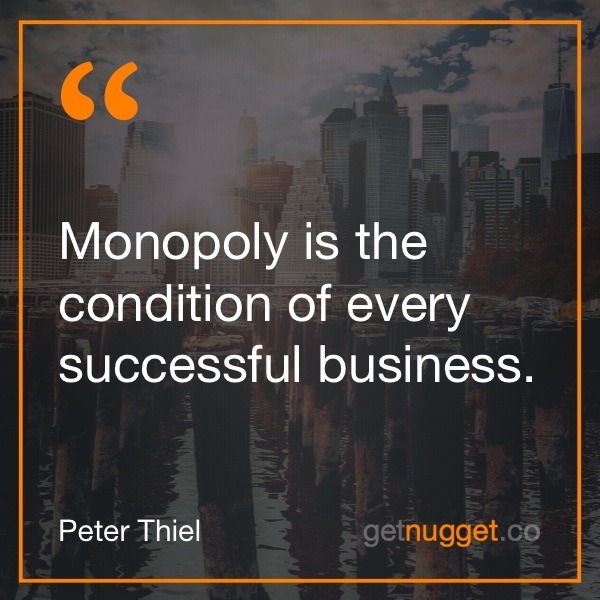 For Thiel, having a monopoly is a condition for running a highly profitable business because it allows the company to set its own prices and thus have high profits. If the product is not better than its competitors, prices will be clearly smaller to attract customers and compete in a low-margin market, which erodes profit margins. The best example, according to Thiel is the commercial aviation industry, where ticket prices are so low that airlines generate only a few cents of profit on every stretch of a passenger’s journey. Google, as a good monopoly, keeps more than 25 percent of its revenues as profits and has been able to generate billions in profits alone in recent years, more than the entire commercial aviation industry. For Peter at present, the world still has many great secrets that most people still do not know or agree on. That makes it harder for them to be discovered because often people end up keeping in line with the status quo thinking and setting aside the contrary view that leads to innovation. Usually, secrets are so deeply embedded in society that it can take years to discover them. In technology, the key is to develop better software/product than your competitors, because that makes your position as a defensible market leader. A startup, to be successful, needs to pursue this kind of secret. Otherwise, it will be only a horizontal progress supplier, going from 1 to n and offering conventional products in a competitive and low-profit margins market. An essential point for creating a monopoly with a startup is that it can take years for it to become profitable in an untapped market. Even if the company does not initially profit, it may still have value because the value is determined by the future profits of the business. Contrary to popular wisdom, lack of profits is not necessarily a bad thing. Thiel’s company, PayPal, is an illustration of this scenario: in 2001, when it did not generate any profits, Thiel projected the company’s revenue for the next few years and found that the biggest of Paypal’s value came from earnings that were expected a decade after. What’s important for a startup is to start small and expand slowly in a focused effort. Just like in a career or study, it is not necessary to have a diverse curriculum but to be far superior in a limited set of things. Being the best in your business is crucial to dominating the market. The expansion should come only after mastering a specific segment with years of advantage over competitors. Jeff Bezos, the founder of Amazon, was aiming to become the largest online retailer in the world but began focusing on selling books on the internet. Only after Amazon has conquered, this market has it expanded to other categories, such as CDs and DVDs, to reach the position of the monopolist in all major categories of e-commerce. Today, e-commerce is synonymous with Amazon, and the company took more than 15 years to consolidate in this position. Be prepared to invest many years of your life in your startup. 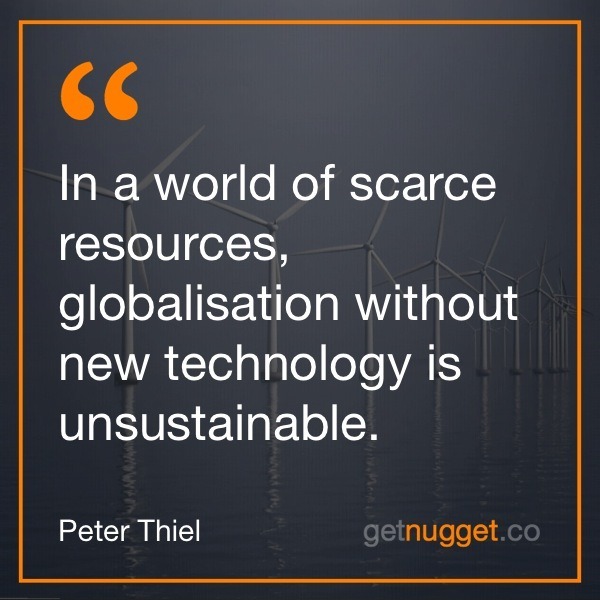 In a world of scarce resources, globalisation without technology is unsustainable. What is your thing? Are you searching for a Zero to One pdf? GetNugget will provide with the best summary of this fantastic book. Peter Thiel has its methods of explaining things. Have you heard that quote – Capitalism is not the same capital?! Capitalism is a brief explanation of state’s policy, while capital is simply money – finances. Do you like your pie fresh and tasty? If so, you must fight with the competition to get more capital and avoid getting involved in unprofitable markets. Students especially are taught that monopolism is bad, it’s a term used to inflict unrealistic prices for company’s services. Fight it or not, monopolies exist, and they will exist forever, no person can change that. It is in our power to see beyond the core teaching and use it for our sake. Become inventive, use some of Peter Thiel’s examples mixed with our book summary and get the “biggest piece” of the pie. After all, the market will force you to protect your interests, whether you like it or not. While many economists argue that perfect competition creates the greatest value. Perfect competition is when a company has a product that is essentially the same as another company’s, or several other companies’. 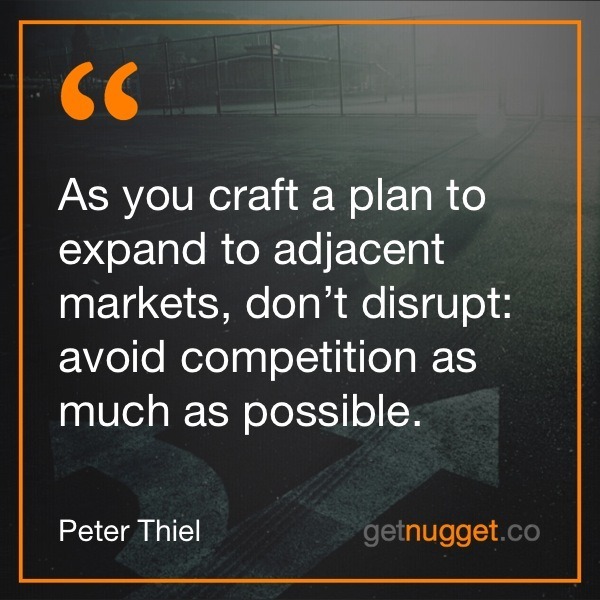 Thiel shows, how in a perfect competition scenario, the companies battle on price, which brings their profits down and that in turn hinders their capabilities to innovate. 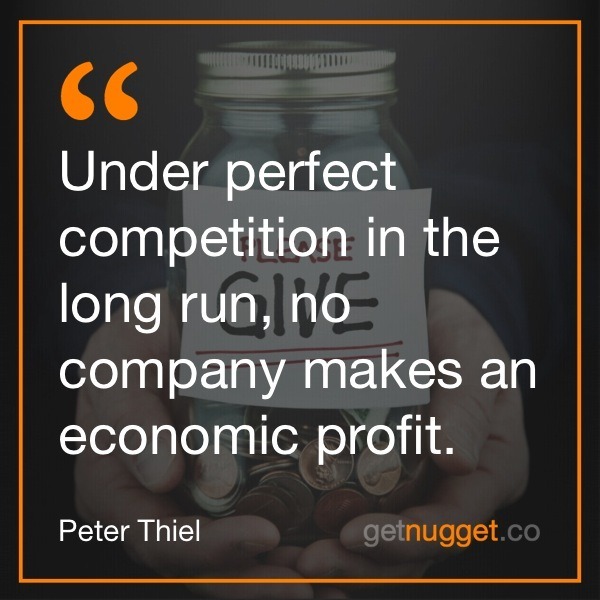 Under perfect competition in the long run, no company makes an economic profit. It’s the creative monopolies who can invest in research that creates new products. They go from zero to one. Proprietary Technology, as for example Google’s search algorithm, is the most substantive advantage a company can have because it makes your product difficult or impossible to replicate. Thiel advocates exponential growth and not linear growth. In order to get to a real monopolistic advantage, the proprietary technology must be at least 10x better than its closest substitute. And the easiest way to create something 10x better is to invent something new. Network effects, e.g. Facebook’s graph, make a product more useful as more people use it. Still, in order to attract a large portion of a market, successful products must start with a small market that they can dominate. Mark Zuckerberg’s first product was designed to get all his classmates signed up, not to attract all people of Earth. Economies of scale and a powerful brand can enforce a monopoly. Another popular business concept is being demystified in Zero to One: the first mover advantage. Sure, first movers get a head start on the competition. But they get caught. Once they’re caught, they fall behind. Instead, a startup should bide its time until its team senses that the time is right to create the greatest development in a specific market. This will ensure its position as a monopoly. 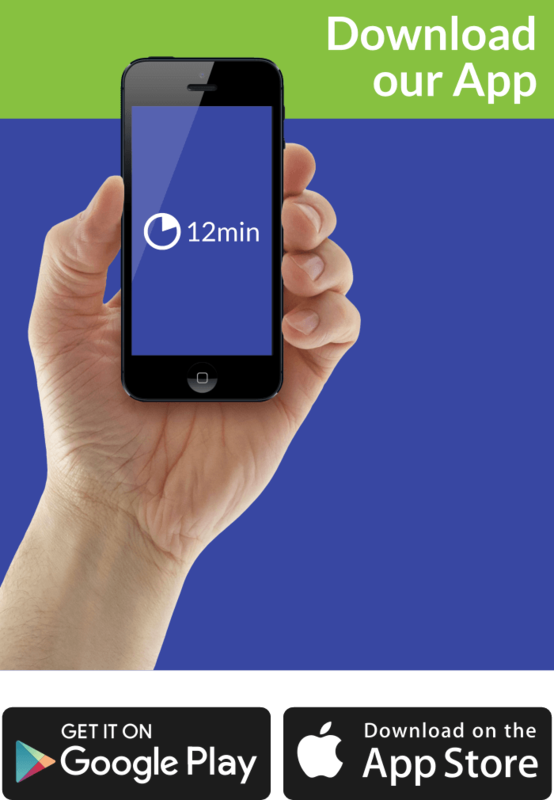 Forget ‘minimum viable products’. Ever since he started Apple in 1976, Jobs saw that you can change the world through careful planning, not by listening to focus group feedback or copying other’s success. As a successful venture capitalist who started the ‘Founders Found’, Thiel is against the ‘balanced portfolio’ approach. In his view, each VC must find a handful of companies that will go from 0 to 1, that will create vertical progress and then back them with every resource. Every single company in a good venture portfolio must have the potential to succeed on a vast scale. 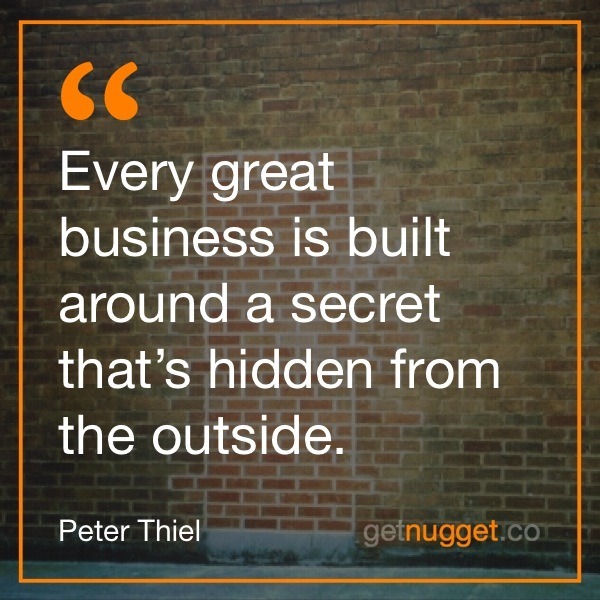 Thiel believes that “Every great business is built around a secret that’s hidden from the outside.” Not believing in secrets means believing that everything that can be achieved has been achieved. The founder or founding team is one of the vital parts of a start-up. And devising the inventive method can help make or break a company. A company does better the less it pays the CEO – that’s one of the single clearest patterns I’ve noticed from investing in hundreds of startups. In no case should a CEO of an early-stage, venture-backed startup receive more than $150,000 per year in salary. This is also true when it comes to employee incentives. You should be looking to hire people who, despite having the capability to work for Google, want to work for you because they’re excited by what you do. 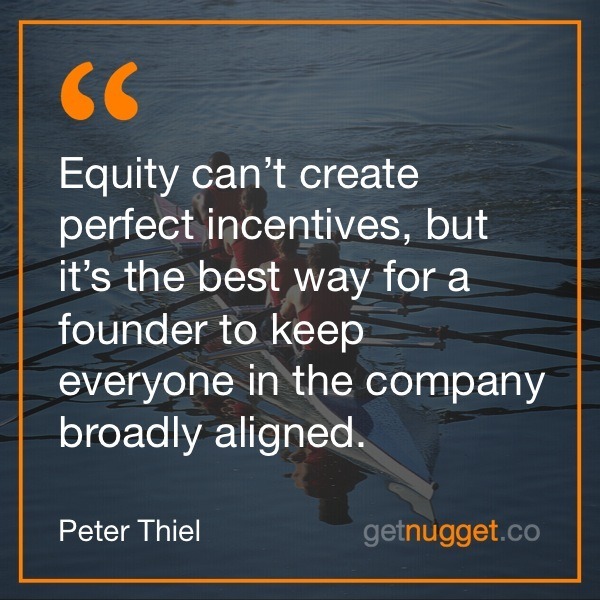 Equity can’t create perfect incentives, but it’s the best way for a founder to keep everyone in the company broadly aligned. A startup is a team of people on a mission, and a good culture is just what that looks like on the insight. You should always follow the power law, also known as Pareto’s principle or the 80/20 rule that states that 80% of the output is done by 20% of the input. 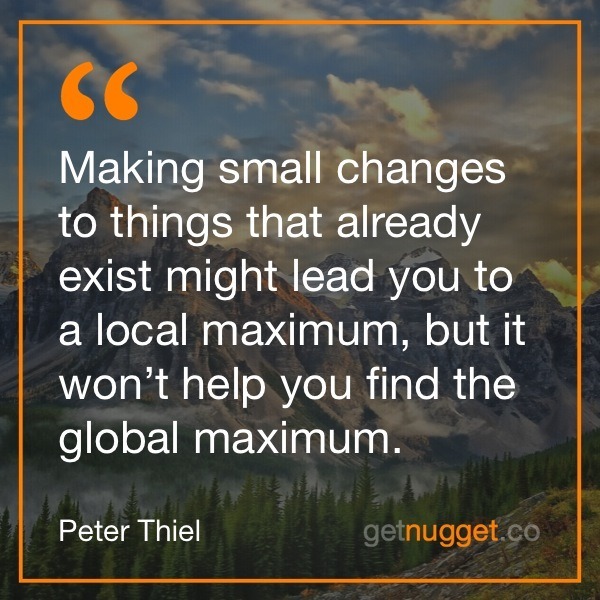 This also applies to the distribution of your product or service. 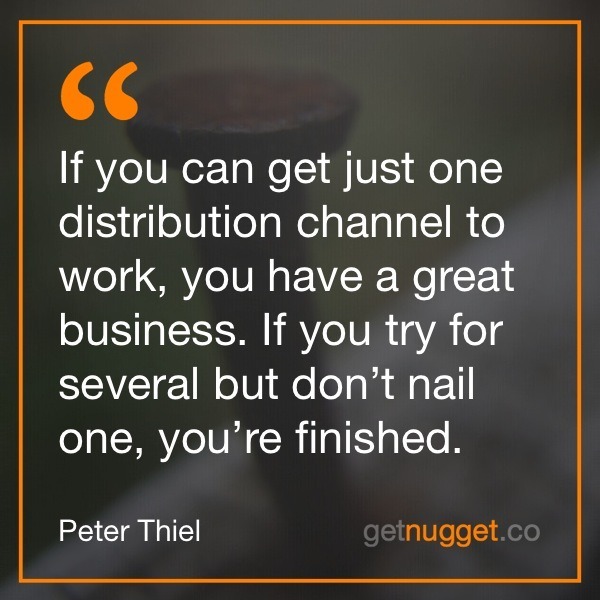 If you can get just one distribution channel to work, you have a great business. If you try for several but don’t nail one, you’re finished. The Engineering Question – Can you create breakthrough technology instead of incremental improvements? The Timing Question – Is now the right time to start your particular business? The Monopoly Question – Are you starting with a big share of a small market? The Distribution Question – Do you have a way to not just create but deliver your product? The Durability Question – Will your market position be defensible 10 and 20 years into the future? The Secret Question – Have you identified a unique opportunity that others don’t see? 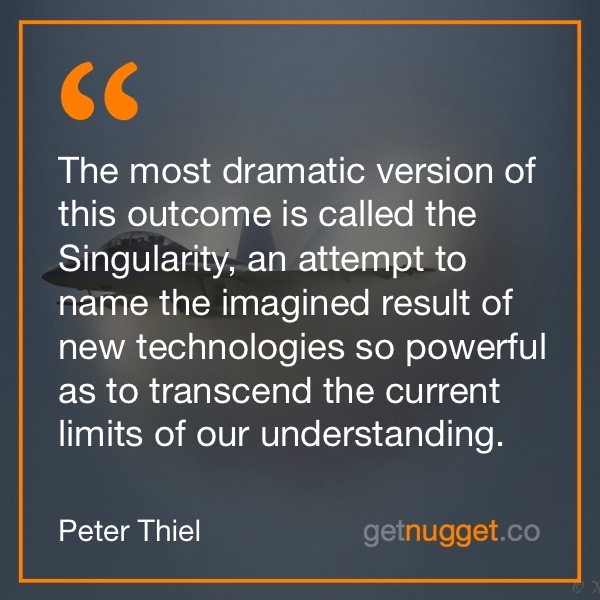 In a nutshell, Thiel talks about stagnation or singularity. There are four different possible scenarios that the future holds for us: recurrent collapse – a neverending alternation between prosperity and ruin, a plateau of development similar to the rich countries today, extinction – a collapse so devastating that we won’t survive it or the take off – an accelerating takeoff towards a much better future. The most dramatic version of this outcome is called the Singularity, an attempt to name the imagined result of new technologies so powerful as to transcend the current limits of our understanding. As my conclusion, Zero to One is a quick and easy, but polarising book. Be it that you agree or disagree with Thiel’s contrarian views, it’s a book that makes you think, shows you the difference between vertical and horizontal progress and puts monopolies into another light. Zero to One is considered one of the best business books of 2014 and I agree with this. It’s a book I recommend you to read. Our task today is to find singular ways to create the new things that will make the future not just different, but better-to go from 0 to 1. In general, technologists and engineers prefer to focus on product development, but innovative products are useless unless a market is created to consume them. There are no products that people will buy if there is someone to sell them. To sell a product effectively, distribution is the keyword. That includes not only your sales channels but also the effort and organization to sell your products. To leverage and have effective distribution, you have to consider the potential of each customer before measuring the effort required to make the sale. At the Palantir data analysis company, also founded by Thiel, each contract becomes tens of millions of dollars, usually with clients such as large companies and even the US government and the FBI. In this case, unlike Paypal, the CEO makes the sale in person, because customers who spend millions expect personal involvement from the company’s executives. If the contracts do not bring in millions, but hundreds of thousands of dollars each, it would not be a time efficient use for a CEO, but you still need a solid sales force to represent your company. If you are setting up a startup, think from Day 1 about how to put together a competent sales team and how to put your product in front of the end user, always. Founders are usually not ordinary people or easy to deal with, for their visions are contrary to the established in the world. They tend to be eccentric people, especially in the big cases of success. Among the founders of Paypal, almost all members are a bit eccentric and many of them, as children, had quite unusual hobbies, such as building PUMPS! That is important because business founders have very great responsibilities in creating a culture and vision for a startup and that idea is even more important than best management practices. An example that illustrates this well and is quoted by Thiel is the return of Steve Jobs to Apple, 10 years after being expelled from the company. Shortly after his return, he has already brought in exceptional landmarks like the launch of the iPod. The vision of Jobs revolutionized Apple (now the most valuable company in the world), created a cultural monopoly, after all the iPhone was light years of other devices on the market, and revolutionized the lives of consumers around the world. A startup can survive by making incremental improvements to existing products and services, but it will only really be giant if it can get a contrary view of the pre-established system and thereby create a monopoly where its product is so superior to competitors that it can set its prices And have high-profit margins. 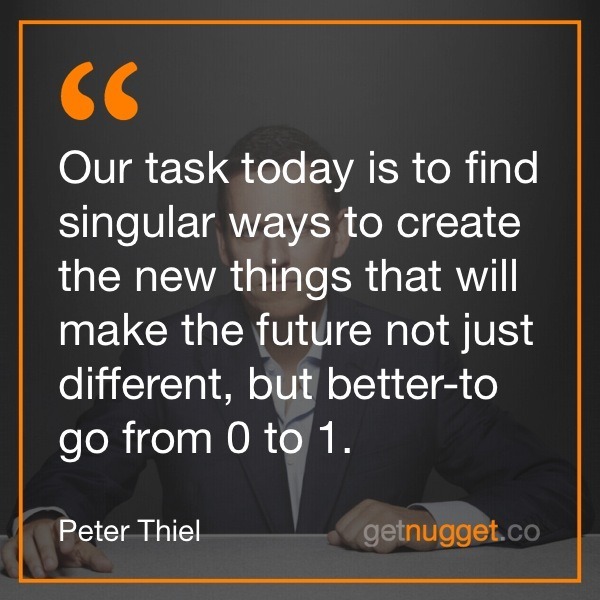 View some of the best nuggets from Peter Thiel’s Zero to One bestselling book. You can see the Popular Highlights from Zero to One here. If you want to receive the full nugget collection from Peter Thiel’s Zero to One, please subscribe below.